Sometimes, just when you think you have just about seen it all with regard to your field of collecting, a suprise shows up on your doorstep. 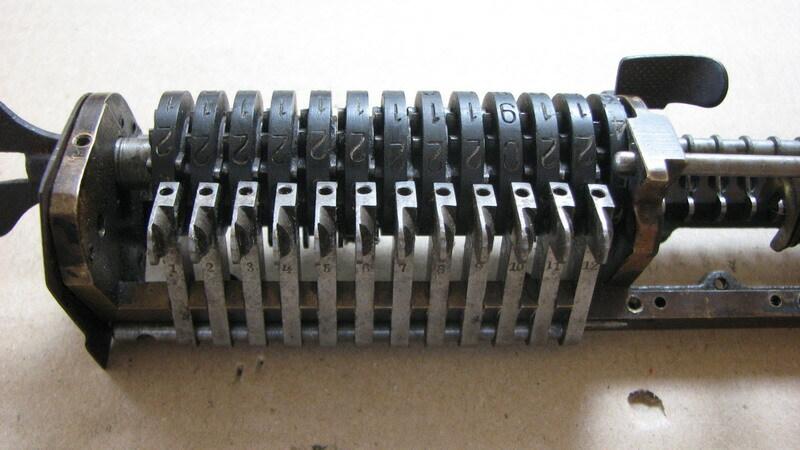 This happened when I bought a pinwheel calculator from France. 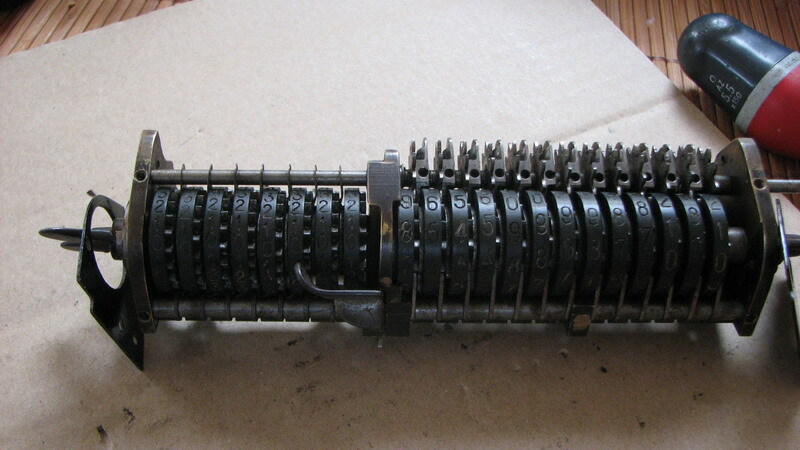 It was advertised with a single picture, as a "Schubert mechanical calculator - in very good condition". A quick look at the accompanying photo will assert that it is neither. To my eye, it looked very much like an early Brunsviga, except for the lack of logo, and the odd direction indications on the top plate. 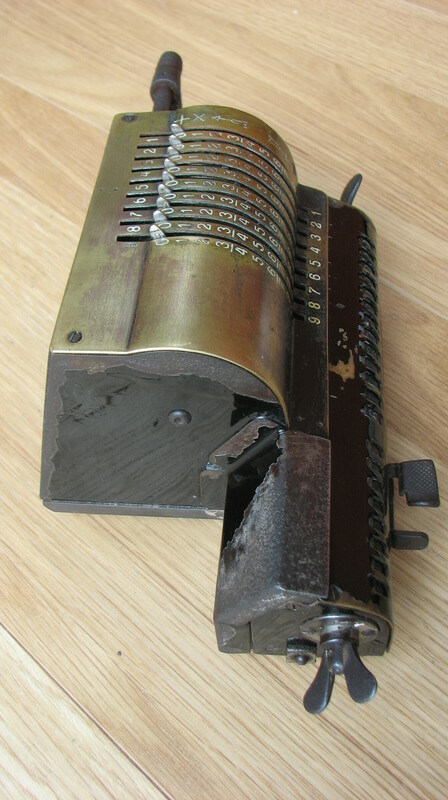 There is no bell, no reset for the input, no comma indicators even, early carriage lock, etc etc. 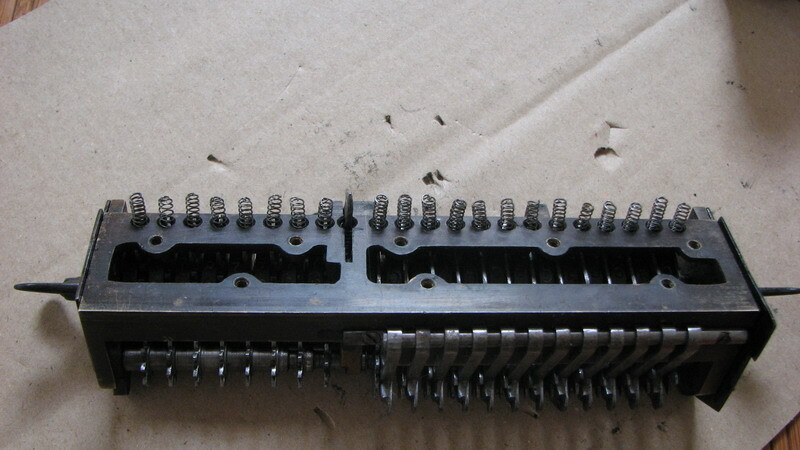 This was interesting, because in France, illegal copies of Brunsviga machines were made prior to the expiration of the Brunsviga patent - and this could be a nice and early one. 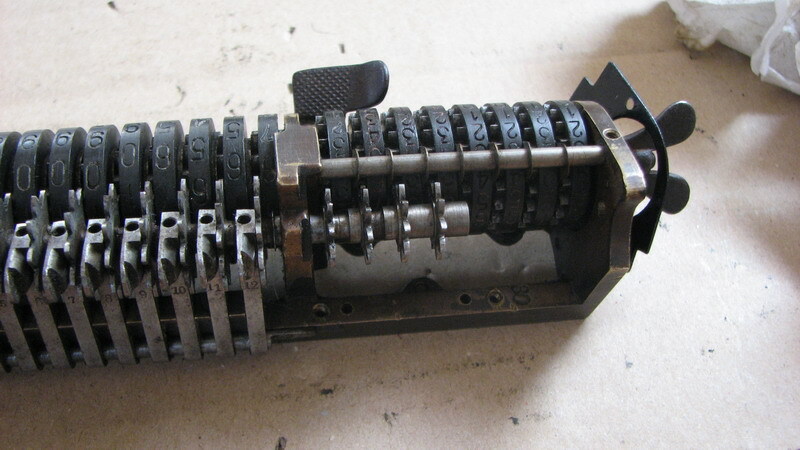 There was no serial number or any other indications, so I thought - well, let's just buy it. After long and difficult discussions with the seller (on payment, on shipping, ...), I finally got to pay the machine, and arranged pickup with my favourite shipper. In order to do that, I had to know the dimensions of the package. The seller emailed me that the parcel weighed 3.5kg, whereas I had calculated with about 11kg. Obviously it was something much smaller than a Brunsviga, but looking more or less exactly like one. 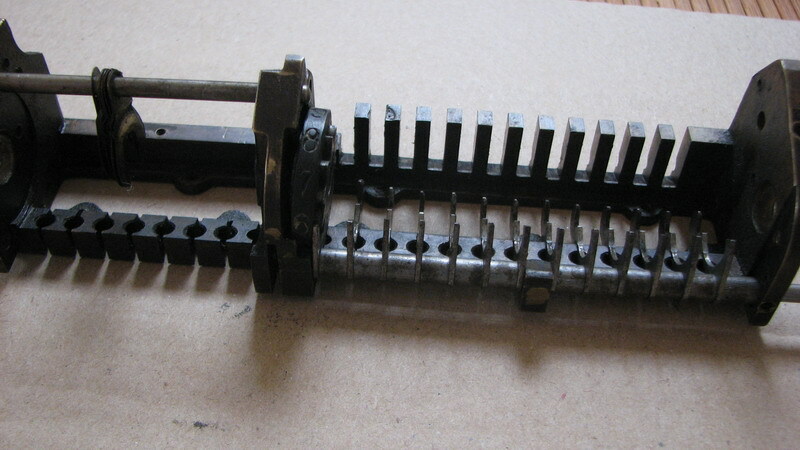 Since I'm not aware of Brunsviga M's with the simple carriage lock, I awaited the arrival of the parcel, quite puzzled. 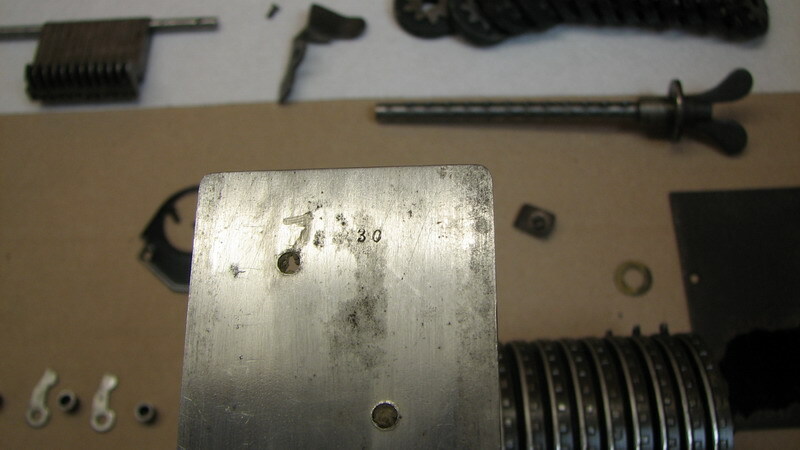 There were no indications anywhere about the maker, or the serial number, except for "30" stamped into the bottom of the carriage shift lever. 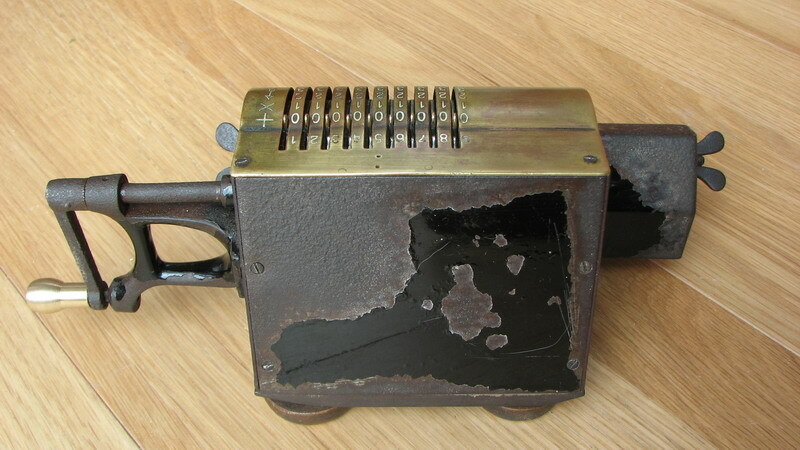 I disassembled the machine to look for clues, but apart from the "30" appearing on numerous other parts, as well as the initials "DO", nothing much was found, apart from the fact that the machine had been assembled with considerable difficulties and later adaptations - many tapped holes without any apparent function, holes for the feet drilled much later, redrilled holes in a slightly different location, strips of metal and shims added in various positions in order to make things work. 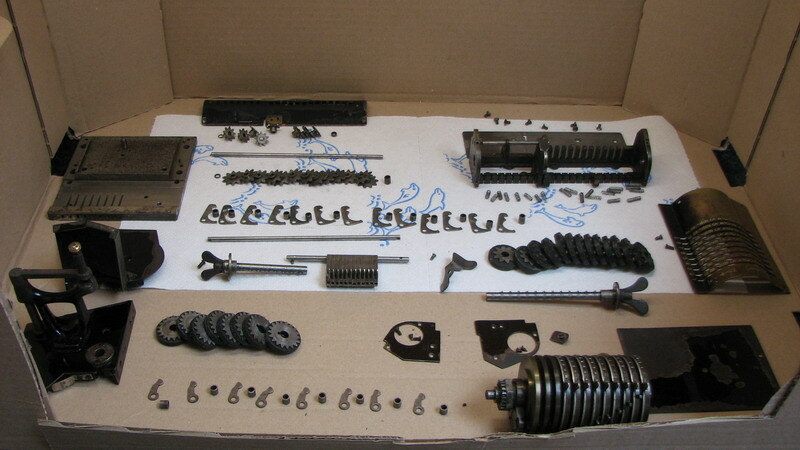 In short, not your average streamlined series-assembly process. 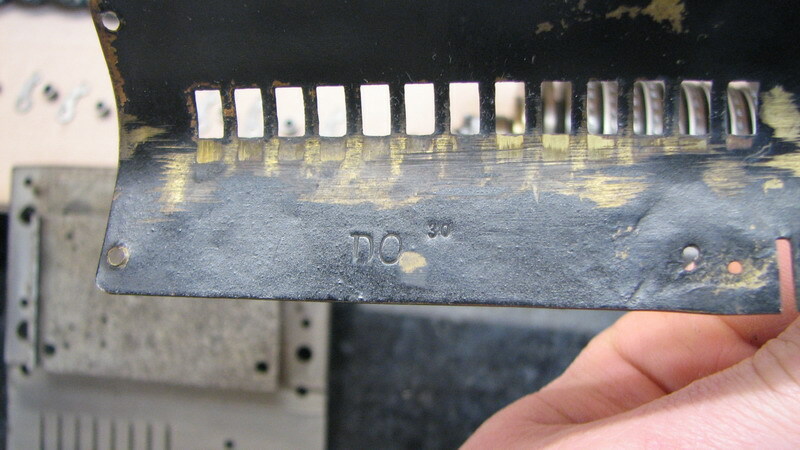 Perhaps it could really be serial number 30 in a very short production run, while the factory was still working out the kinks. And perhaps "DO" was the mechanic who worked on it? 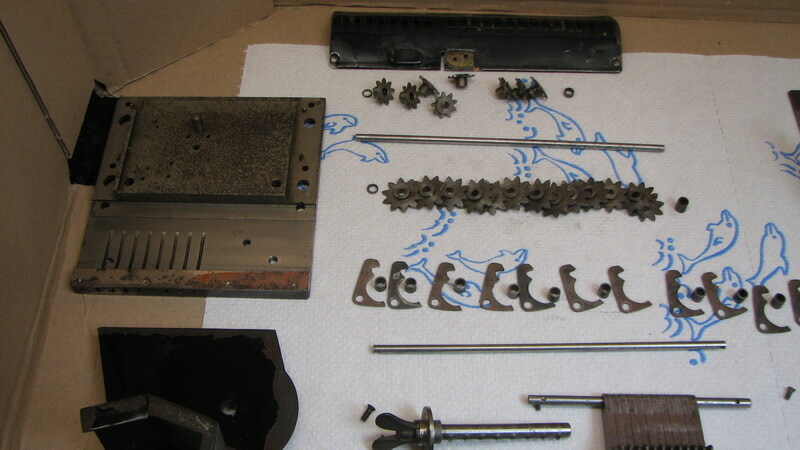 Then of course, it was "Rechenmaschinen-illustrated" to the rescue - starting in 1892, I clicked on every machine I didn't recognize the name of - often simple troncet adders, calculating discs or chain adders. But then, having arrived at 1911, I found this page. 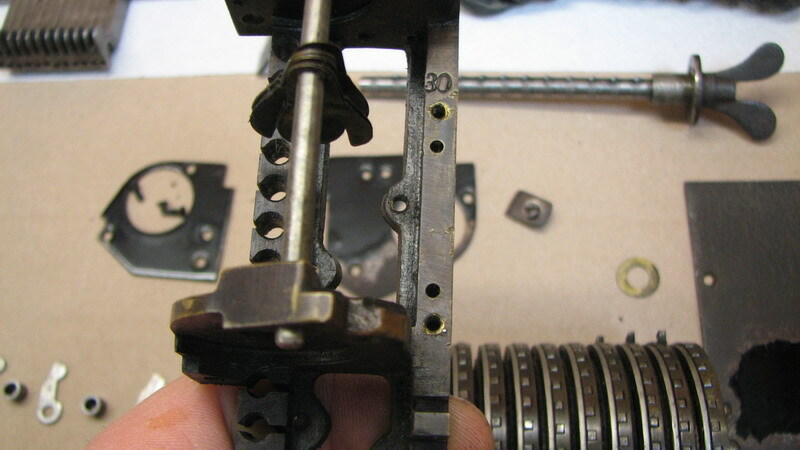 Sure enough, the carriage lock, the lack of logo, the tilted orientation of the clearing thumbscrews, the odd direction indications on the top plate - it all fit! 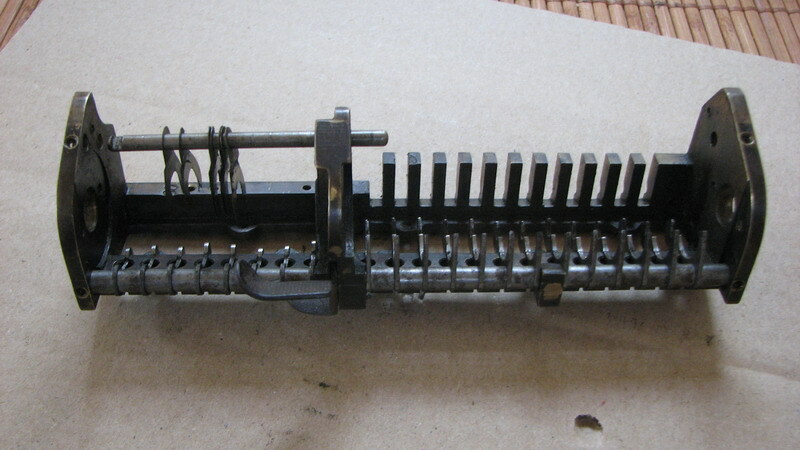 My new machine is a "Preciosa", built by the Ungarische Rechen- und Schreibmaschinenfabrik A-G in Kassa/Koschau/Kosice, in (Austria-)Hungary, and later (Czecho)Slowakia. By the time Martin's book was published, they had changed their name to "Laplace Rechenmaschinen und elektrische Uhrenfabrik". The company was managed by Viktor Bernovits (1869- Oct. 18 1961) who leaves no relatives. 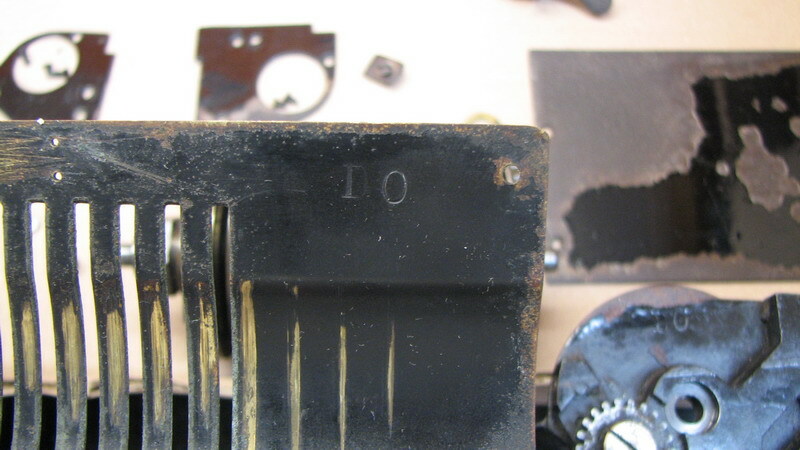 The Laplace electric clock factory was, with engineer Robert Michl, the first to issue a really usable synchronous clock, and many patents were taken out by Michl on the motors and mechanisms into the 1930's and 1940's. 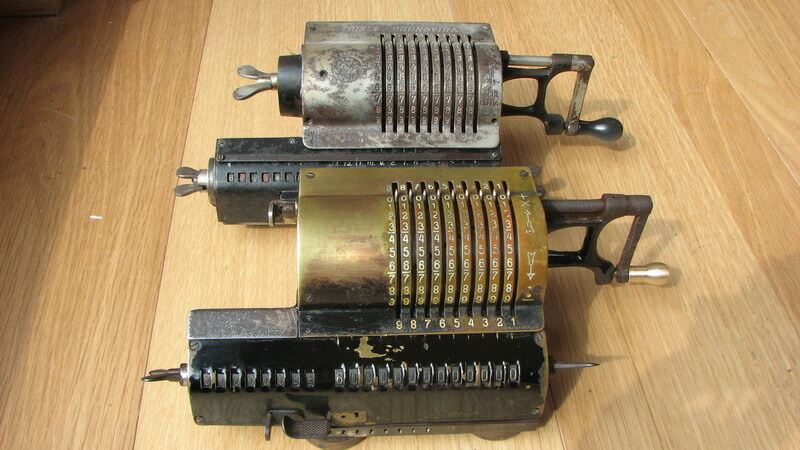 By then, calculator manufacture seems to have been abandoned. After the war, all trace of the company vanishes. 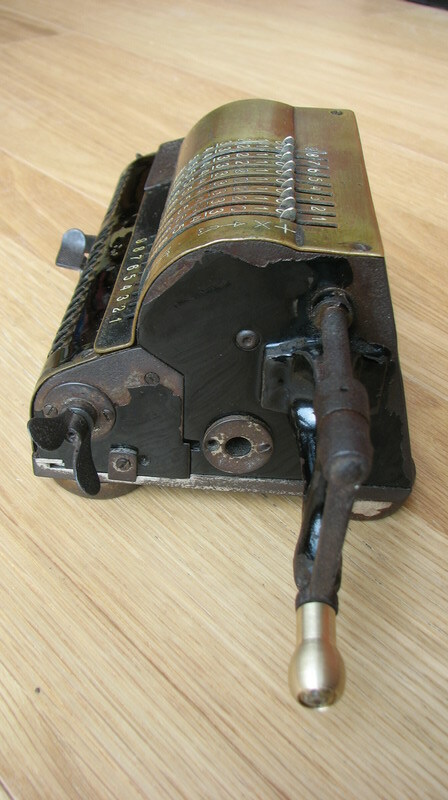 There is only one picture of this machine on Rechenmaschinen-illustrated, which probably indicates that the machine is rather rare! 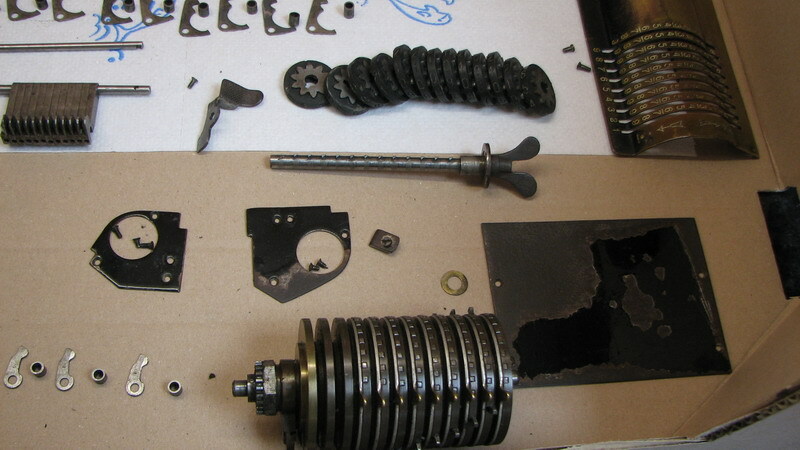 Luckily, there is also the Rechnerlexicon, which has more details on the machine, on the mechanical lookup table that is supposed to accompany it, and also a copy of the German patent for a special provision for error-prevention when shifting the carriage. 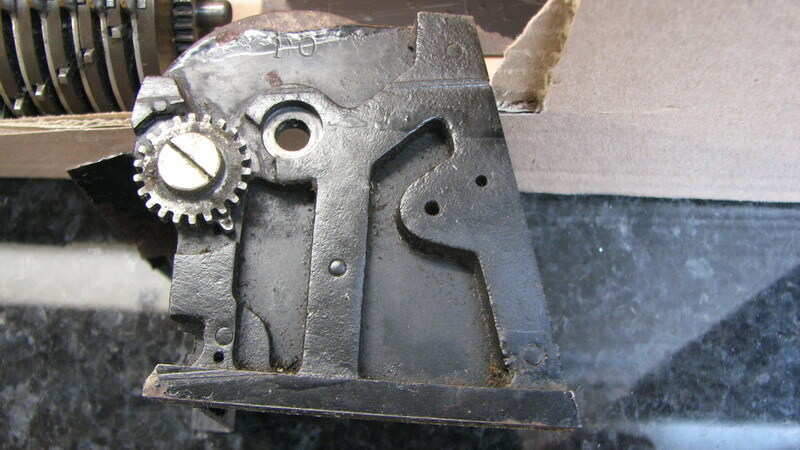 That leaves only a few questions unanswered - the first one is, what happened to the large lever that is supposed to stick out on the righthand side of the machine? 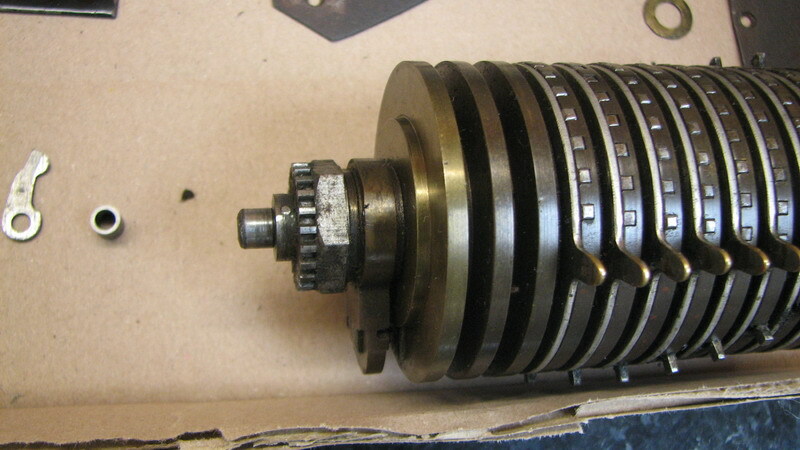 Was it ever there, but the mechanism taken out? 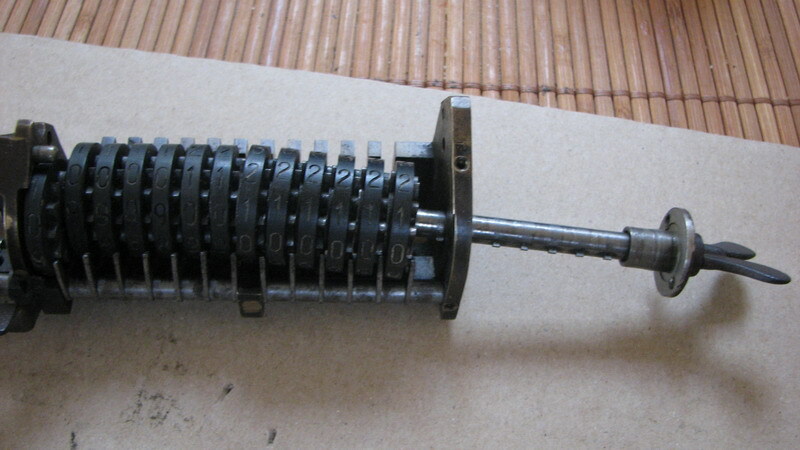 And what was it for, because the patent describes a system where a prismatic plug is forced between rollers mounted on the carriage when the crank handle is turned to start a calculation - but there is no mention of this large lever. 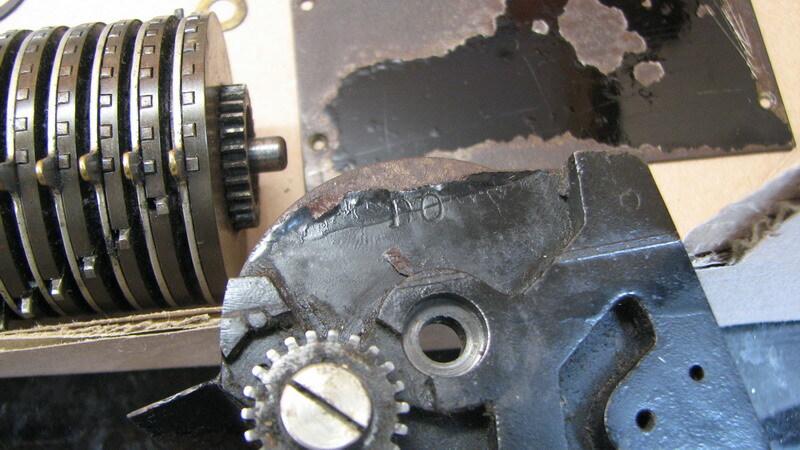 There are some holes though that could have been used for mounting the roller plate from the patent, there is a tapped hole that could be for mounting the internal lever that operates the prismatic plug, but there is no disc on the pinwheel cylinder to operate this lever - was the system there, but taken out on refurbishment because it was too troublesome, prior to a second hand sale? 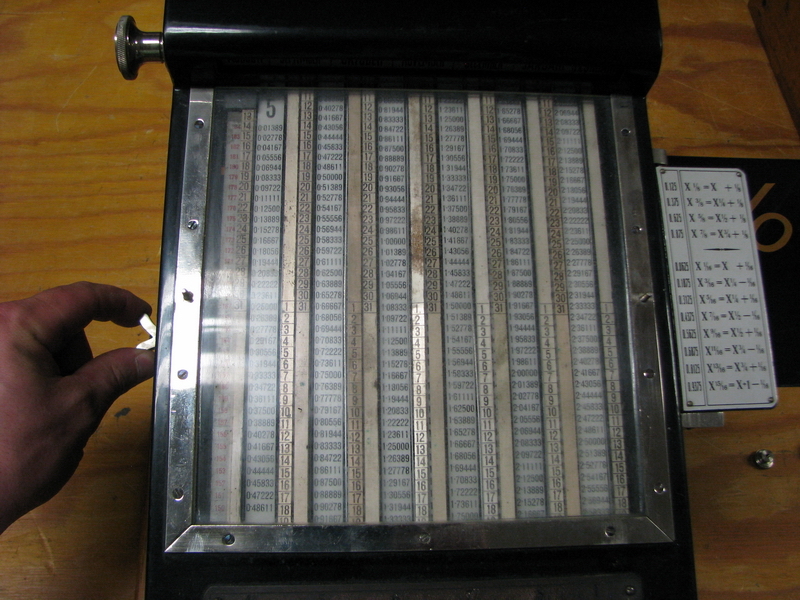 Are any "Preciosa" machines left which have this system in place and functional? 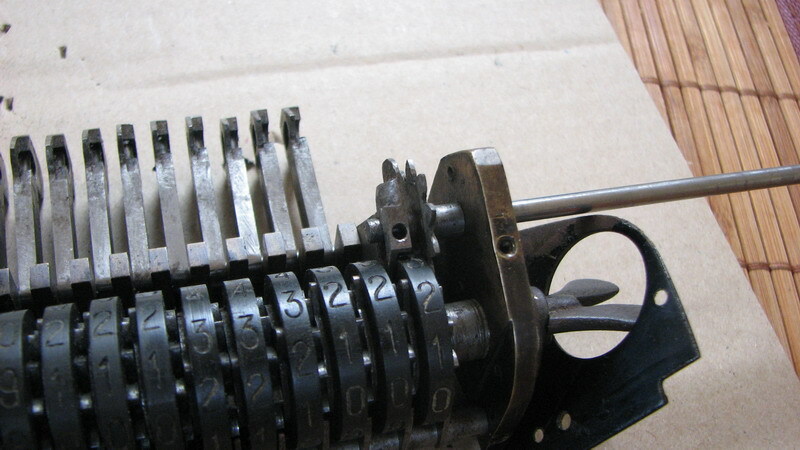 The seller knew some of the history of the machine - it was used in the 1920s and 1930s by a travelling salesman in the North of France. 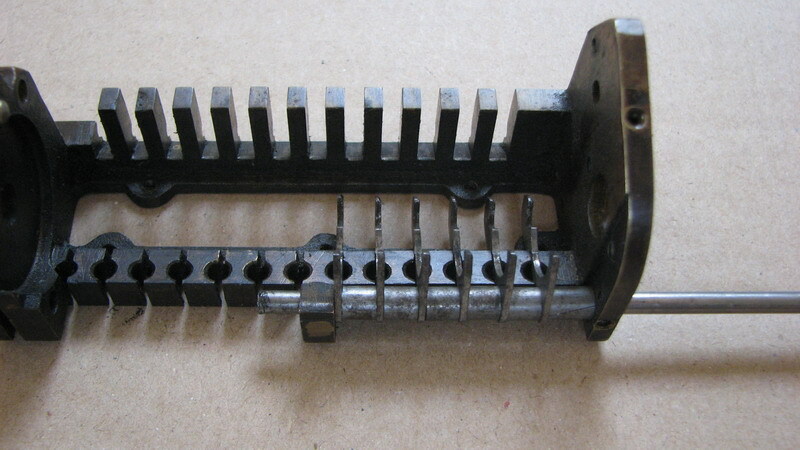 The machine would have been ideal for this, as it is very small and light - but 1920 is too late for this machine to have been manufactured, so perhaps it was sold in combination with a "Procenta" mechanical interest lookup table, and afterwards sold second hand to our salesman, who had it taken off the wooden board, feet crudely installed on the base plate of the machine itself, and all the unnecessary mechanical clutter removed - if the carriage location system was installed in the first place. 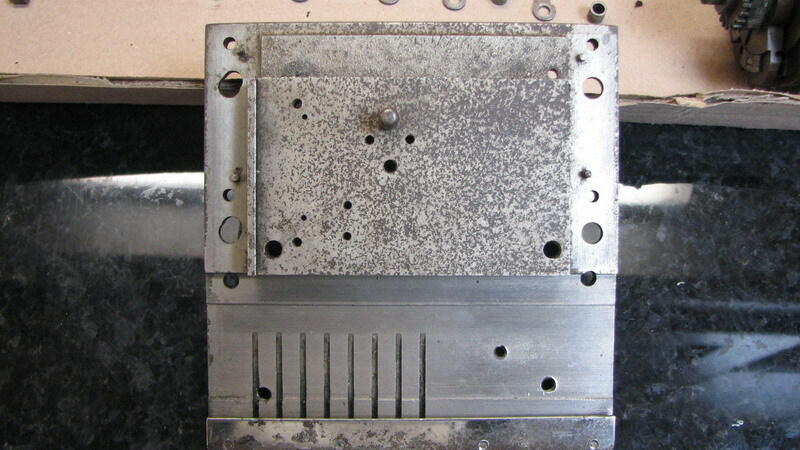 The top plate on my machine has two pairs of holes to be used for mounting long thin pointers evident in one of the other known machines, the one at the bottom indicating the current position of the carriage, and the one on the top being a bit of a mystery, it simply pointing between the fourth and fifth position in the input register. 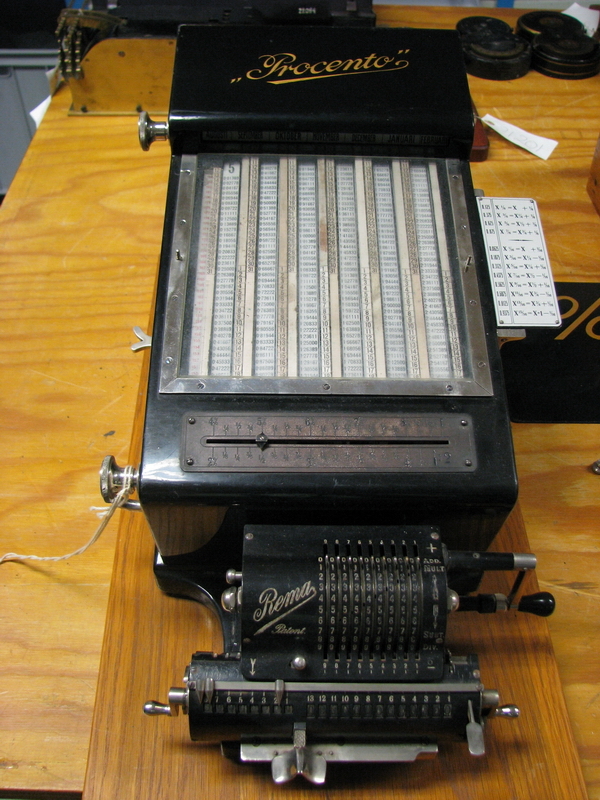 There is also some Swedish promotion material known (also on the Rechnerlexicon) The Tekniska Museet has a Procenta calculator, accompanied however by a Rema I machine, and not by a Preciosa. 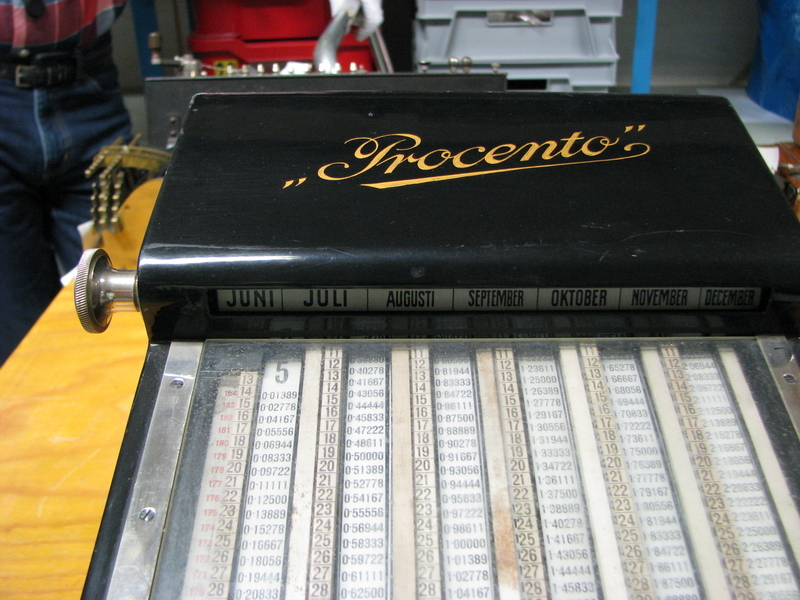 On the advertising material from Procenta, the machine is not a Rema, but a Preciosa, with the slanted back to fit against the lookup table, but without the large lever sticking out on the right side, without comma indicators on the carriage, and also with the thumbwheels on the carriage standing straight up instead of slanted. 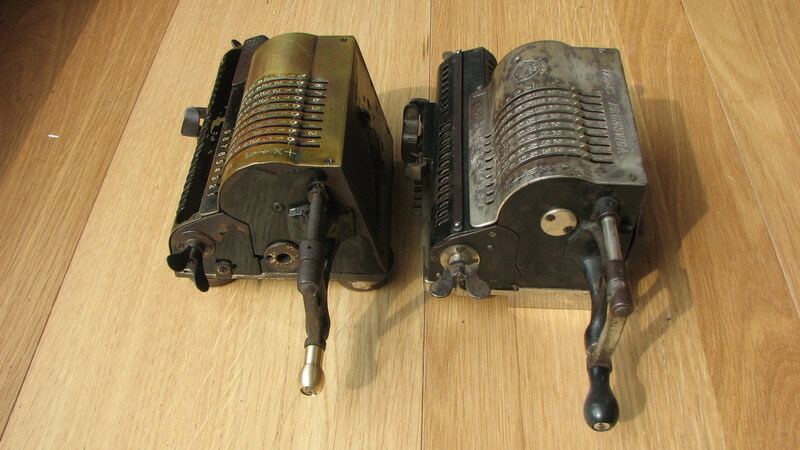 If anyone knows of another one of these machines, any information would be most welcome. 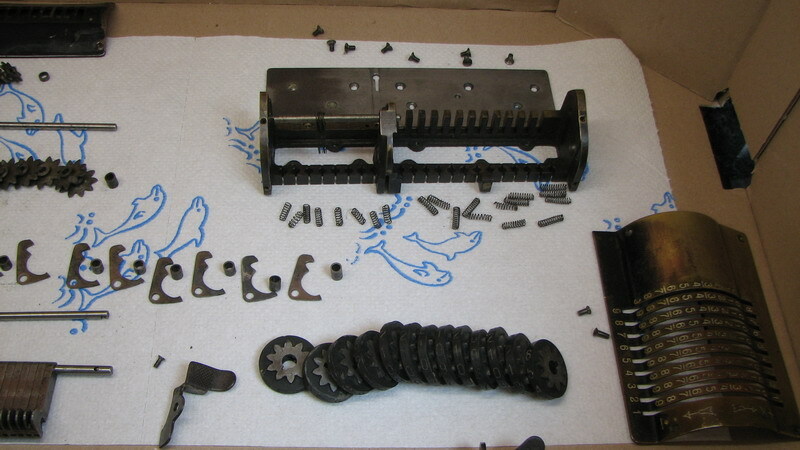 We'll end with some pictures of the disassembled machine, then pictures of the reassembly (usually I'm too lazy to take those, but it gives some insight into what is involved in reassembling a pinwheel calculator) and then finally its official portrait. 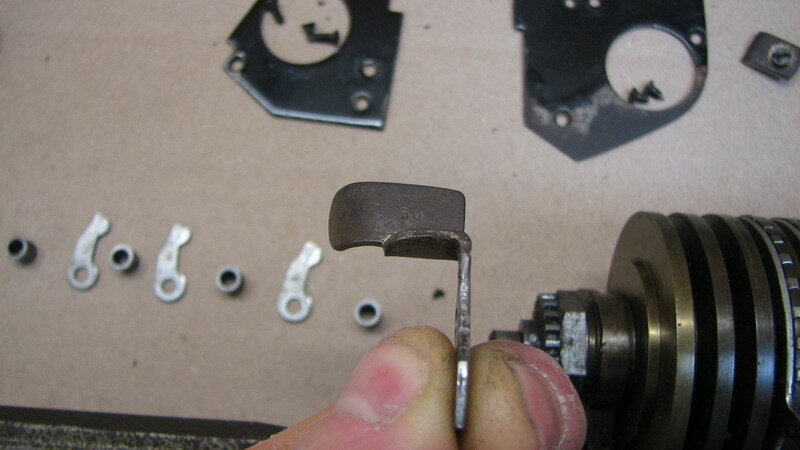 I turned up a replacement crank handle from brass, since I did not have a suitable piece of black plastic or bakelite. That also makes it obvious that it is a later replacement. 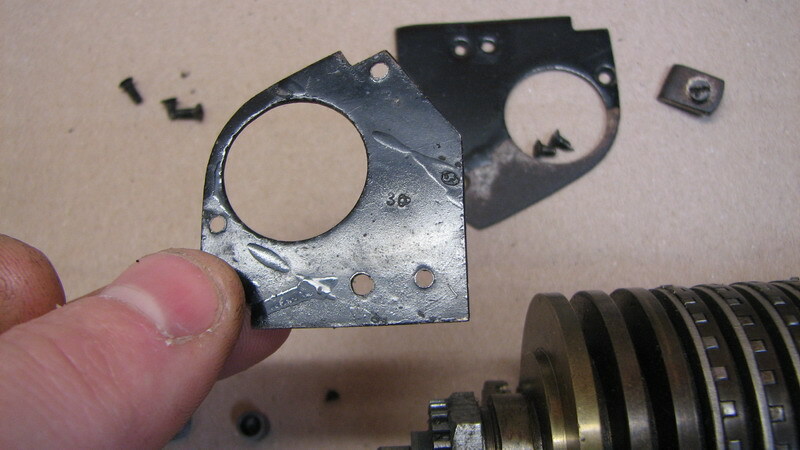 ...but a lot of extra holes in the base plate! 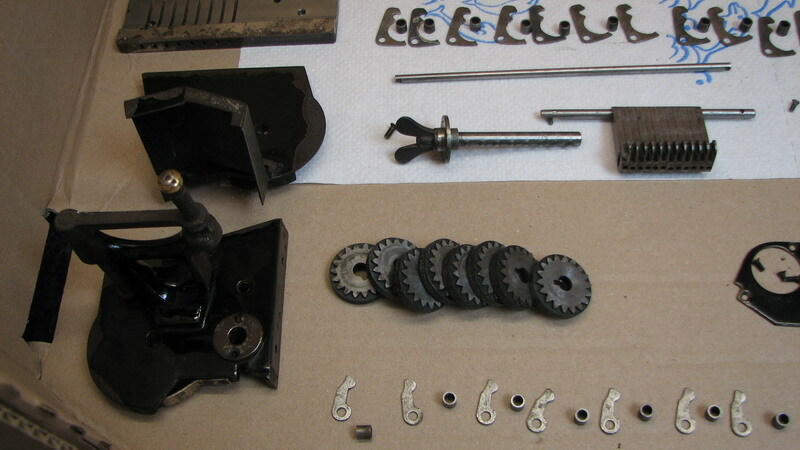 Now for the reassembly of the carriage - I have done no restoration, just cleaning. 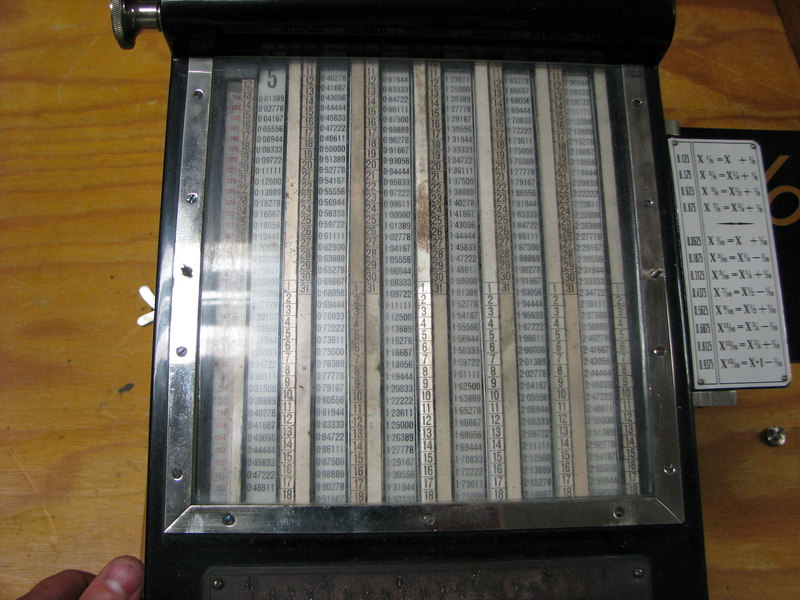 I could fill in the red and white of the numbers with paint, aggressively polish the iron where the nickel plating has disappeared, or even replate, polish the top plate, there is even a lingering repair to the clearing tooth n° 13 of the main register that still needs to be done ...but I think it is important that this machine be left in "as found" condition, albeit a lot cleaner. 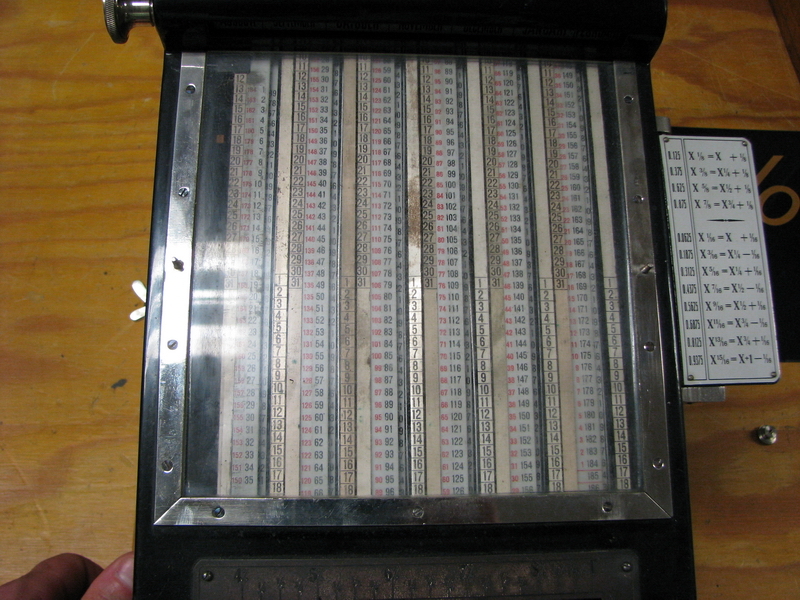 This is the setup - lookup table for interest factors on the back, and calculator on the front. 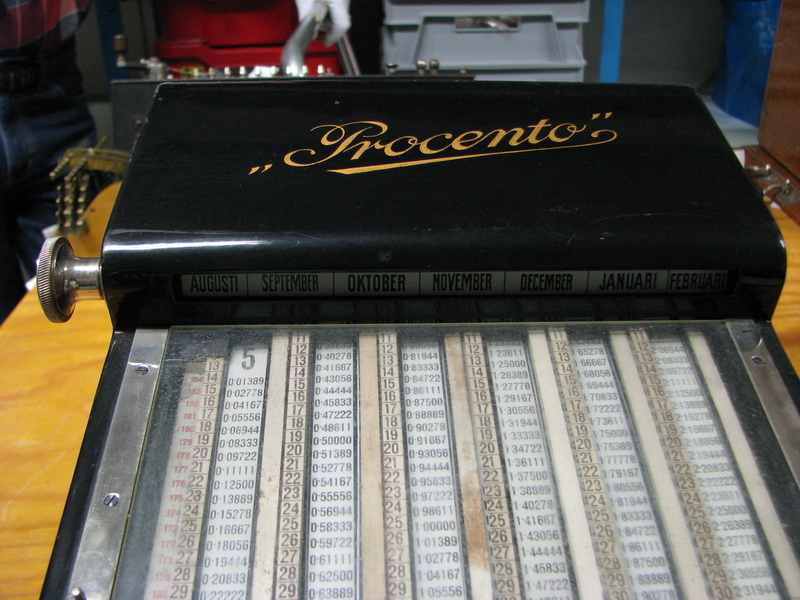 The Preciosa calculator was designed as a companion for this exact interest table - hence the slanted back, to not leave any unsightly gaps when seen from the side. 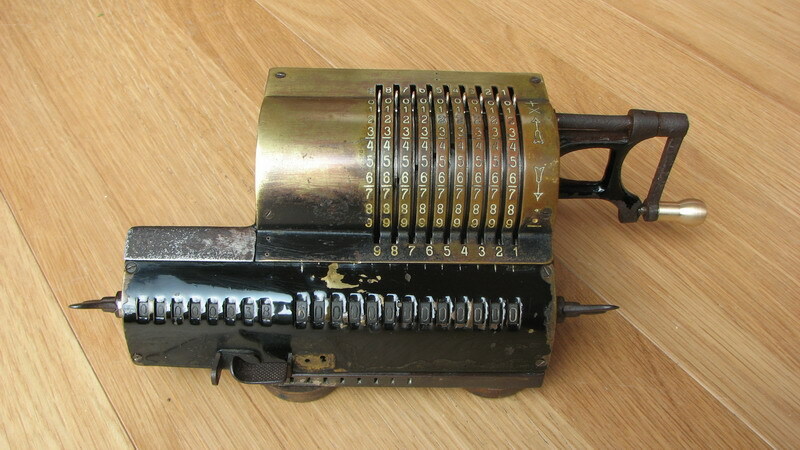 The Procento table in the Tekniska Museet has a Rema calculator mounted in front. 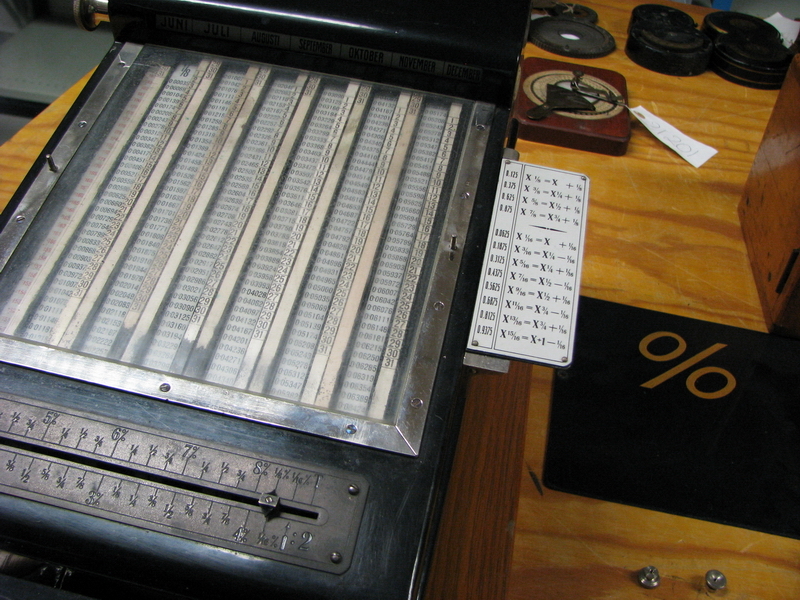 The table has a slider at the bottom which allows to set the interest percentage directly in increments of 0.25% on the top scale, and by division by 2 by 0.125% on the bottom scale. 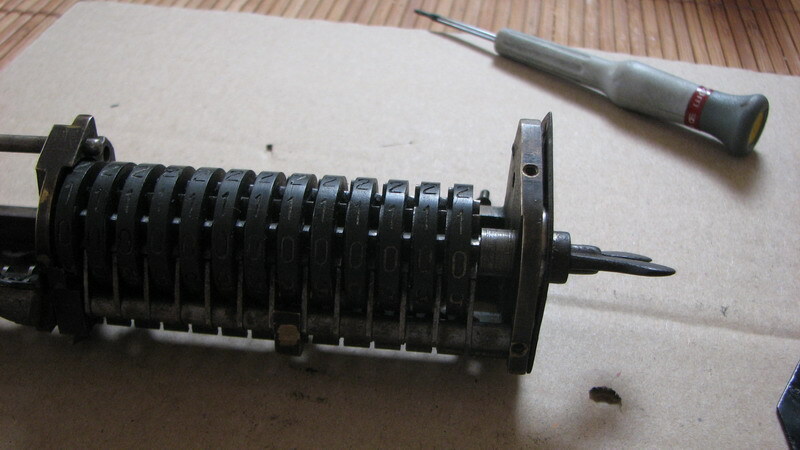 What this does is to rotate the cylinders with the scales behind the window. Since the table is intended to be able to read compound interest for a certain number of days, there are sliding scales next to each column. 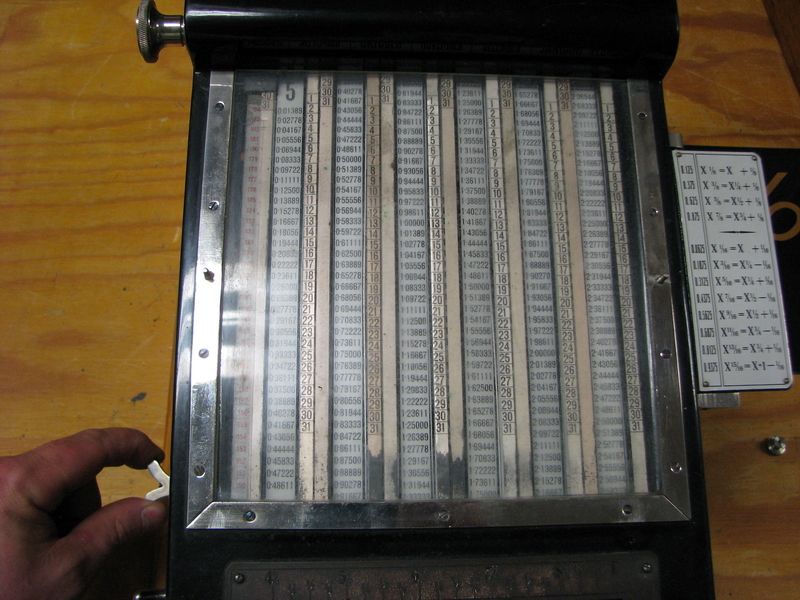 The sliding knob at the side which my hand is on allows to shift day 1 from top to bottom along the column, and the 31 day in the other columns follow suit. If one is interested in a number of days from the start, there is another lever, which shifts a red column which is numbered continuously with the days to the right over the table values. 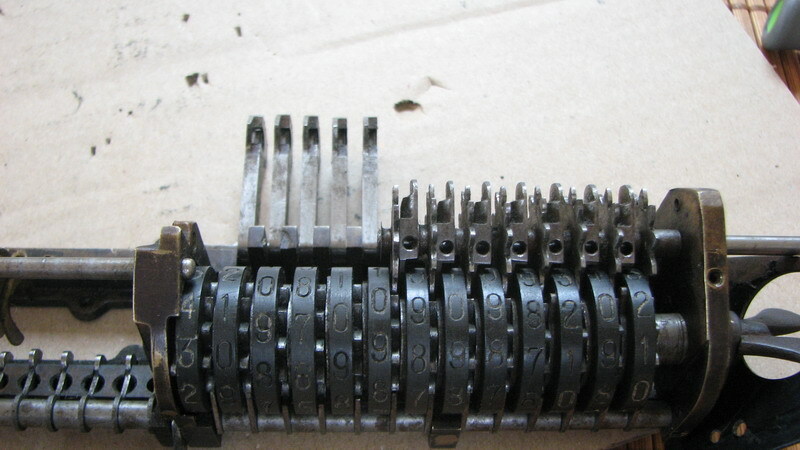 This allows, without having to look elsewhere, to verify what the value is for day, say 163, by twisting the knob, looking at the black 163 and letting the knob go, at which point the "day scale" shifts out of the way and reveals the table value for the interest. There are complementary numbers in red counting down from 184, if you want to go back into the past instead of into the future. To make sure that you do not make any mistakes, there is also a roll at the top which displays a succession of months, to be used in conjunction with the white moveable strips numbered 1-31 on the table. 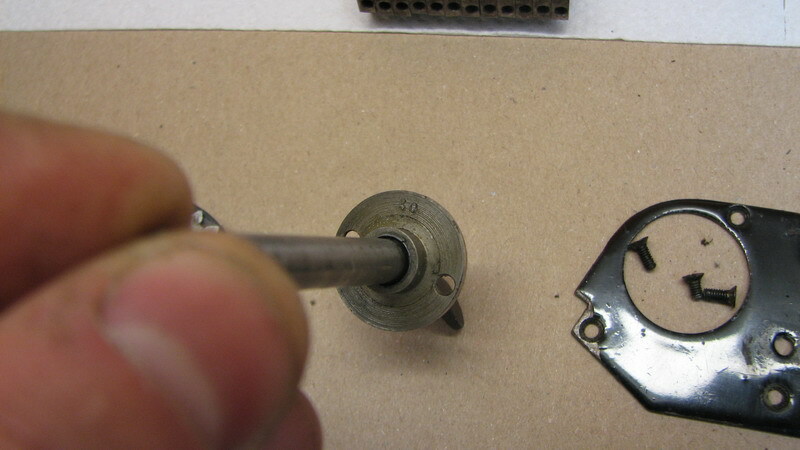 Turning the knob shifts the months. Finally, at the end of the scale, there are special tables with increments, in order to halve the tabulated intervals between the various values. There is a special table with increments for 1/8 and 1/16. The memento in white which flips up from the side, shows the combinations for e.g. calculating an interest at 3.1875% - this would be the value in the table for 3.250% minus the value in the increment table for 1/16 . 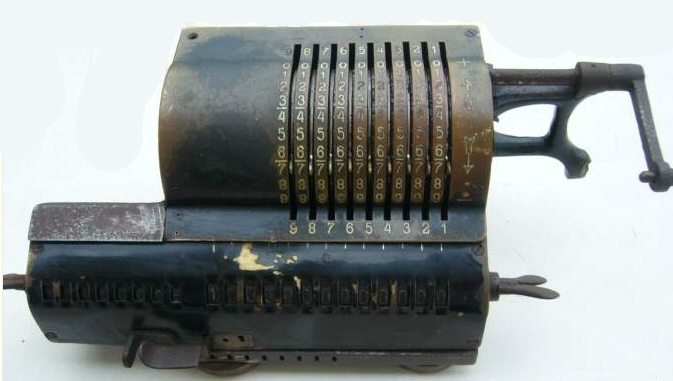 It is now very clear how the combination of calculator and lookup table could be used to advantage - the table values can be set straight into the input of the calculator, after which only the amount still had to be cranked in, immediately giving the desired result - interest at X percent after Y days for amount Z. 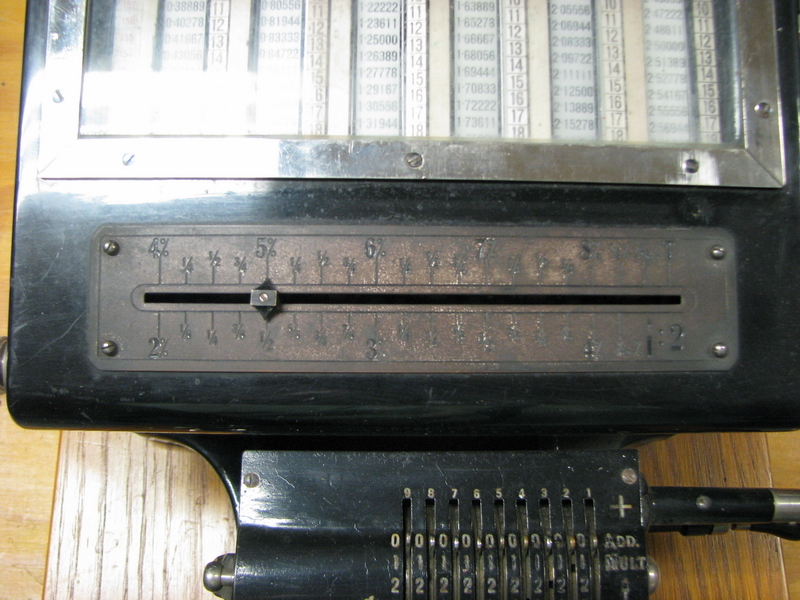 For interpolation with the 1/8 and 1/16 tables, an addition or substraction had to be effected, and the result immediately reset in the input register of the calculator, whereas the lower interest values between 2% and 4% still needed a division by 2 of the table value, which could be done in the operator's head, or, in case extreme rigorousness was required, the division could be made by machine and the result reset into the input register.